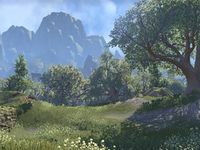 The landscape of Summerset Isle is similar to that of its sister island of Auridon, with warm climate, colorful forests, idyllic meadows, and craggy mountains. Most of the southern part of the island and a central region in the north are covered with mountains, with a central pass linking the western and eastern parts of the island. The highest mountain on the island is Eton Nir, located in the northern region. Coral is abundant on the shores of Summerset Isle; the Coral Forest on the eastern shore is one of the best-known coral formations. Coral formations are sometimes found far from the sea, which suggests original occupation by the Sload. A river with two tributaries named The Clott flows into the northeastern shore. The isle is home to the city of Alinor, the capital of the Summerset Isles and the seat of the High Elven rulers since time immemorial. The city of Cloudrest sits atop Eton Nir, the highest mountain. Other major cities include Lillandril, Shimmerene, Sunhold, and Dusk. The Crystal Tower, one of the eight mythical focal points of Mundus, was once located in the northern mountains. Like Auridon, Summerset is also dotted with Aldmeri ruins. In the sixth century of the Second Era, during the Interregnum, Queen Ayrenn, daughter of King Hidellith, formed the first Aldmeri Dominion, an alliance with Valenwood and Elsweyr whose goal was to conquer Cyrodiil and seize the Ruby Throne. 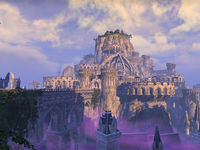 Ayrenn chose Elden Root in Valenwood rather than Alinor to be the capital of the Dominion, and her cousin Alwinarwe ruled Summerset on her behalf. Around 2E 583, Ayrenn issued a decree that opened the borders of Summerset Isle for outsiders, which resulted in an influx of immigrants. The Second Era also saw the Abyssal Cabal's plot to sink Summerset Isle. The Cabal were a group of Sea Sload who wanted to reclaim the island for their underwater kingdom of Ul'vor Kus. They joined forces with the Court of Bedlam, an alliance of the cultists of Nocturnal, Mephala, and Clavicus Vile who attempted to gain control over the Crystal Tower around 2E 583. Both groups were defeated by the combined efforts of the Soulless One and the Psijic Order. In the Third Era, Summerset Isle, along with the rest of the province, was incorporated into Tiber Septim's Empire. In 3E 110, the island was almost lost to the Maormer in the War of the Isle. In the late fourth century of the Third Era, Summerset Isle was visited by the Eternal Champion, who retrieved one of the pieces of the Staff of Chaos from the Crystal Tower. 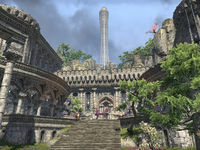 In 3E 433, the island was devastated by the Oblivion Crisis, with the hordes of the Daedra managing to topple the Crystal Tower. The forces of the Thalmor contributed greatly to repelling the Daedra, which later allowed them to gain control of the whole province, and ultimately form the Third Aldmeri Dominion, the dominant force in Tamriel in the early Fourth Era. Summerset is known for its beautiful cherry blossom trees that come in pink and white varieties. It also has red and purple maples trees as well as gingko, sea grape, spruce, and mangrove. Small plants that grow in the area include blue and purple wisteria, yellow oleander, pearlwort, and glasswort. 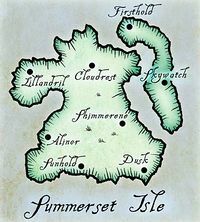 Summerset Isle was originally inhabited by species such as Gheatus, welwa, and Illyadi, which were exterminated by the Aldmer when they colonized the island (although the welwa were reintroduced into the island's ecosystem in the Second Era). 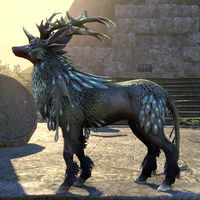 The most iconic Summerset animals are gryphons and deer-like indriks. The canah is the exotic bird of Summerset Isle, bred for its beautiful feathers. The capital of the Summerset Isles. It is located on the western shore, along the Oleander Coast. A city perched atop Eton Nir, the tallest mountain. 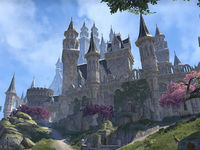 Also known as Crystal-Like-Law, this structure was of symbolic importance to the Altmer just as White-Gold was for the Ayleids. A city on the southeastern tip of the island. The tallest mountain in the Summerset Isles, located near Cloudrest. It is the site of some of the Isles' most amazing architecture. A city that is home to the College of Sapiarchs, located on the western shore. A city on the eastern shore, also known as the City of Lights. A city with the largest port on the Isle, located on the southern shore. The main road to Sunhold winds its way through the Eastern Pass.